Club Conflict is currently in BETA, as such, things like websites clients and servers are bound to break. Because of this, delays may happen beyond our control and your participation in our Beta requires that you understand this. We will do our best to keep you informed of any problems or delays by posting News regularly on our website. All rules are subject to change at the league admins discretion. Introduction: Established in 2002, Club Conflict was originally an invite-only gaming league ran by an awesome online gaming community. Today we are opening our doors to CSGO teams across North America and our gaming community has grown into that huge phenom we know as esports today. We thank you for your participation and encourage your feedback. Club Conflict begins its’ 21st. Counter-Strike Season January 30, 2019. The regular season schedule will be released on Monday January 28, 2019 at noon EST. Any matches scheduled prior to this deadline are tentative only. Please utilize the built-in messaging system (needs some work but is functional) to contact the Director of Operations, Ballistics with any problems. Admin’s Say is Final: The League Admin can change any rule and make any determination they like. Their decision is final, you must accept it. Playing in our league is dependent upon you understanding this very simple rule. Membership: Participation in Club Conflict is a privelage not a right. To maintain the privelage, please observe all of the following Club Conflict rules. Teams: Teams must have a minimum of (5) and a maximum of (10) fully registered (Steam ID Linked) members to get placed on the schedule. Once you are on the schedule, you are free to add and remove members as long as the rosters are open. Please try not to have under the minimum number of players allowed (5) listed while you are making roster changes. Scheduling: Plan on playing your matches on Wednesday night at 9PM EST. If you cannot play on Wednesday, Check the schedule and contact your opponent before Wednesday and request a reschedule. Unless your team has communicated with the opposing teams' scheduler prior to Wednesday, your opponent is not required to even offer a reschedule. All weekly matches must be played by Sunday at midnight EST. If your team (the team requesting a reschedule) cannot make the opposing teams reschedule offers, they are not required to acommodate you and may take a FF win over your team. If you have a minimum of (4) ready to play on match night, you may elect to play 4 vs 5. Rescheduling: The following feature is for Team Captains and or Schedulers Only: If you wish to reschedule, use the Club Conflict websites' built-in messaging system to contact the opposing team prior to match day. To do this select the message tab and select the compose tab. Select "send a message to the Captain(s) of the another team". In the "Team Search" box enter a partial team name. Select the team you wish to message. Fill out the Subject and the Body of the message and send it. The message will send to all Team Captains and Schedulers. Any match reschedule requests received after Tuesday at midnight EST need not be considered. You may post in our #Match Scheduling Discord Text channel to assist in communicating with your opponent but use the sites' built-in PM system first. Wild Cards: Wild cards are found in the event schedule. They are glaring holes left in our rosters by teams that do not make good on their commitment to finish the season. Teams may play any team they have not been regularly scheduled with and that they would like to challenge. Simply contact the teams' scheduler and notify them that you would like to use your Wild Card (or theirs) to play them and ask them if they accept the challenge? The map will be a "map veto". If your team has chosen to take a FF Win on a Wild Card, you may later elect to rescind that FF Win and opt to challenge an eligible team. If your team has already recorded a win (your opponent left the league) you may keep your win. You can not play any team more than once during regular season. There is no limit on the number of times your team can play in a Wild Card challenge, as long as your team is not already scheduled to play the challengers, you may accept their challenge. Teams that could benefit from gaining a Wild Card match are allowed to seek out teams with eligible (scores not yet recorded) Wild Cards and ask to play. Upon completion of your match, contact a league admin to get your match results posted. Wild Card matches not completed with a scheduled opponent will not count against the opponent. Forfeit Wins against an opponent will not be recorded. Only matches completed will be recorded. League Forfeiture: Teams that do not show for any matches or become unresponsive will be removed from the league. If a team is removed from the league for lack of participation, that team will be penalized from playing in the league for a minimum of one year. The penalized teams' members, however; may join any other league team without further penalty. Team Owners who suffer a League Forfeiture are not permitted to create any new teams and join those new teams to any CC events for a minimum of one year. Team Owners who suffer a League Forfeiture are permitted to play on a participating league team as a player only and they may not become the "Owner" of a new team until their suspension is completed. Be Professional: Our organization is supported by some great brands. These brands associate themselves with Club Conflict because we have developed a respected organization that provides fair and drama-free competition for all. Team Owners are responsible for the actions of their team members. Having team members that "act up" on stream or in matches may get your team suspended or banned from competing in future events. Good Sportsmanship: Club Conflict is a drama free zone. Please do not accuse your opponent of cheating. If you have a problem, notify an admin after the match and we will look into it. We do not condone racism, sexism, outright harassment or aggressive behavior towards others online or at our live events. Our events are supported by fantastic sponsors who go out of their way to provide prizing for our events. We owe it to them and our fellow Club Conflict members to treat each other respectfully. Our good sportsmanship policy is not only restricted to our website and match/scrim servers but also includes any Club Conflict related behavior on social media and streaming activities. Behavior: Play every match as if it were being streamed LIVE! Team owners are ultimately responsible for their team members behavior in-game as well as out. Team members who violate our Good Sportsmanship policy may, at our admins discretion, disqualify their team from competition or otherwise penalize their team for their actions. Message Mode 2: When playing a match, please stick to mm2 or message mode 2 (team chat). MM1 or message mode 1 (all chat) is to be reserved for negotiating scheduling or match related details between teams. Posting your dissatisfaction to how a round played out in mm1 is not welcome. Dropping from a match before it is finished is considered rude behavior. Taunting the other team with words like "autistic, tism or down's" or prematurely typing "gg" will be dealt with swiftly. Negative comments after a round loss will not be tolerated. Violation of this rule can result in your match win being overturned or another penalty (ban/suspension) at the League Admins discretion. Fairness: No VAC Banned, Game Banned or Community Banned (No Red Bans) Steam accounts may play in Club Conflict League. Players with "red" VAC, Community or Game Bans are considered "Untrusted" and cannot participate in Club Conflict events. Club Conflict members who have Steam accounts VAC/Game/Community Banned will get a minimum of a (1) year ban at Club Conflict. Vulgarity or Racism: Team or Player names that are considered vulgar or racist are frowned upon. Your Player Profile links to your Steam account. Racism or what may appear as Racism on your Steam Account is not permitted. Admin disciplinary actions will be administered to violators of this simple rule. Team Owners: Be careful who you allow to be your Captain or Co-Captain. They will have the power to add/remove players including you. If you are an organization who wants to own a team, we recommend that you are active in your owners role. To maintain control of your team, do not assign a Captain or Co-Captain role to anyone not part of your organization. A Scheduler role is all that is needed. Team Name Changes: We discourage teams from switching names and organizations during the league season. All name changes must be approved in advance. To change your team name once you have registered for an active event or league, contact a league admin. Professionalism: Although Club Conflict may not be the largest or most well known esports league, that does not mean that we do not strive to be. We expect all who participate, at every level, to remain professional. Playing in our league is a privelage not a right. That privelage can be revoked. Our league is supported by advertisers and sponsors. Our league is supported by viewers of our streams as well as by the members of our organization. All of our supporters deserve to be treated with dignity and respect. Team Owners must ensure that their players are aware of this at all times. Failure to remain professional by adhering to our good sportsmanship and behavior guidelines may result in administrative action being taken including having matches forfeited, team and player suspensions and bans. Advertising: Do not spam or advertise in-game or anywhere else on our website or in our Discord server. This includes spamming binds in-game, websites included in player names or in chat (Discord or in-game). There are appropriate places to advertise your team website (Team Profile Page) or your stream/videos (ex Discord Share Your Twitch #Text Channel). Who Are You: To help support our casters and admins, we ask that you use the name provided on your player profile and your teams’ roster during matches. If an admin asks you to change your name, please comply. Your player name may be enforced at the server level, be sure the name you want to use is on your Player Profile. Demos: GOTV demos are required to be recorded for all online matches. Additionally, each player must record a client demo of their Club Conflict match. The demos must be made available to the league admin upon request. In-game voices are recorded in the demo. To record a demo, in console prior to Lo3, type record "demoname" without the quote. We suggest record ccwk2_nuke etc. Keep your client demo. If a league admin asks fopr your demo you must produce it. Failure to have a demo could result in a match being overturned or other admin action. Capture Screenshots: Please grab a screenshot of the score at the half and the final score. WinningTeam Captain is required to submit the (2) screenshots in the #screenshots text channel in our Discord. Streaming: By playing and participating in Club Conflict events, you agree to be streamed. Club Conflict will periodically stream Official Club Conflict League matches. These matches are recorded and may be uploaded to Youtube for viewing. Streaming of league matches by league players is allowed provided CC League is not already streaming the match and a minimum of 2 minute delay is implemented. When streaming league matches we require a minimum of a 2-minute delay to avoid stream sniping. GOTV: GOTV may be available for viewing matches. Each server's default GOTV port is 27020. GOTV is on a 2 minute delay. Teams and Coaches are not to be using GOTV for "stream sniping". GOTV is for fans and friends to watch the match. Spectating Match Servers: No players or coaches may "spectate" a match. Only CC admins and League Casters may spectate a CC match. Coaches may use the .Coach feature to spectate their team. First, join the correct team, then type in in-game chat type ".coach" to become your teams' coach. Match Servers: Our scrim servers and match servers are 128-tick servers. Our match servers require the use of the Club Conflict Client (Windows 7, 8 and 10 compatible) to connect. The password is cc. Please ensure you are not interrupting a match before you connect. *Please note - Only League Admins/Casters can spectate a league match. Running our Client: You must close CS:GO before opening the Club Conflict Client. If at any time the client does not communicate with the master server, it will kick you from the match server. Be sure your firewall and or antivirus is not blocking the application. It's best to check your client for issues before match day. Running Scripts: Use of scripts to gain an unfair advantage of your opponent are not allowed. Examples of these are bunny hopping scripts. Use of key binds are allowed. Examples of key binds are binding a key to purchase weapons with a single keystroke or binding a key to Jump and Throw for more consistent smokes. Buy Binds and Jump Throw scripts are legal. Scripts may not contain wait commands. Scripts that contain wait commands are prohibited from league play. The Match Leader may cancel the match (example: wrong settings were picked, players on wrong teams) by typing .cancel and selecting menu option 2. Match Support: All support for league matches will take place in the Club Conflict League Discord server at https://discord.gg/69yvhnw. If no support is available, please email Ballistics. Team Rosters: Rosters will be open until the final two weeks of regular season. Although roster additions can be made until then, we require (3) original team members to remain on the team heading into playoffs. To be considered an original team member you must have been on the team for a minimum of (4) weeks during the regular season. In other words, your (3) original members must be on the team no later than the end of week #4 of regular season. We require a minimum of (5) members and a maximum of (10). Prizes will be shipped out to the (5) members delegated by the Team Owner. We will not ship (5) prizes to one address and only rarely ship more than one prize per address. Subbing in Matches: A sub may join the server as soon as your 5th player drops. At no time is your sub allowed to be on the server prior to your 5th dropping. All subs must be fully registered (VAC ban, Game Ban and Community Ban Free Steam Account Linked) Club Conflict members. At no time can a player that is not registered participate in a match. Teams that play non-registered members may receive a FF loss. Tactical Timeouts: Each team may use up to (4) Tactical Timeouts per map played. These timeouts are limited to a maximum of 2 minutes (honor system) in length and (2) may be used in a single half. To call a timeout type “.Pause” in game chat. The timeout will take place during the next rounds freezetime. To end the timeout, type “.Unpause”. The timeout will end when the other team also types “.Unpause”. Technical Timeouts: Tactical Timeouts that exceed 3 minutes become Technical Timeouts and require a league admins attention. Occasionally Technical Timeouts may take 20-30 minutes to resolve. Causes of Technical Timeouts may include server issues, teams having ping or connection issues etc. The league admin may have to make a Technical Ruling which will instruct teams on whether to proceed with the match or not. Occasionally the admins Technical Ruling will include the use of the Match Medic functionality built into our Match Mod. The Match Medic enables us to reset a server and the teams' economy to what it was on a previous round. Coaching: We allow Team Coaches to observe their team during the match. To enable Coaching, first join your team (ensure you are on the correct team). Type .Coach and the MatchMod will announce that you are Coaching the respective team. If you selected the wrong team prior to "Live on 3", simply select the correct team and type .Coach again. After the match goes LIVE, if you disconnect as a Coach and return to the match, you will automatically be placed back into team spectate for your respective team. Coaches in Voice Chat: We do allow team coaches to be in voice chat with their team during matches; however, we also forbid coaches from watching the GOTV/Twitch stream during the match. Stream sniping is not allowed. Checking Your Opponent: It is the Team Captains’ responsibility to check the opponents Steam ID’s before the match begins. Type “status” in console and take a screenshot of the Steam ID’s. Compare them to their teams’ roster. Any match that goes live results may stand, depending upon the decision on a case by case basis by the league admins. Reporting Wins: It is the responsibility of the winning team to report wins. The Team Owner or Captain should record the score being sure to include the score for each half. Pay attention to which team you are recording the score for. Navigate to the “Results Tab”. Navigate to your match and click the small pencil icon to edit the match score. Once finished select the check mark icon to save your results. Your opponent will be notified via email that the score has been submitted and will have the opportunity to dispute the score if need be. Fifteen Minutes: This is how long a team is required to wait on an opponent or a representative from the opposing team to join the server on the default match night. If the team you are supposed to play has not communicated or attempted to communicate a need for a reschedule prior to match day, your team may record a FF win. To support your claim, take a status screenshot showing all (5) members of your team on the server and have it ready. We may ask to see it. Points System: Win = 2 points, FF Win = 1 point. Loss = 0 points, FF Loss = -1 point. Teams generate points for their performance in the league. The top 8 teams will advance to the playoffs and this is determined by your teams’ points. You may find that making up your match is better than taking a FF loss. Play the Match: We truly believe that all teams want to play their matches but real-life events can often challenge our online lives. We ask that you do your best to accommodate teams that request a reschedule. If you request a reschedule the day of your match, your opponent is not required to offer you a reschedule. You are at the mercy of your opponent. All weekly matches must be played by the end of their scheduled week on Sunday at midnight EST. Teams who do not play their match by Sunday at midnight EST will receive a FF loss (both teams). Avoid a FF loss by showing on Weds at (PM EST ready to play. Regular Season Maps: We will be playing predetermined scheduled maps for regular season. This gives teams a chance to practice and prepare for the map in advance. If a map is listed as veto, teams will play with the map veto rules below. Changing Maps: The Match Leader (person who types .Setup for the match) can select to "Change the Map" by selecting option 6. When the map changes, type .Setup once again and select the options for your match. Knife for Sides: During most matches where a single map is being played, teams will knife for sides. When "Knife for Sides" is enabled, meet your opponent in the middle of the map and knife it out. The team that wins can choose .swap or .stay. If you spawn with a pistol or bomb during a knife round, do not use the pistol or plant the bomb. Veto to a Single Map: Before playoffs we schedule one opponent to be a Veto map. This will familiarize you with our Match Mod. Set up the CC Match Mod for Teams Switch Sides (No Captains unless Map Vetoing), Veto (to a single map), Knife for Sides Enabled and GOTV Demo Enabled. To do this connect to a match server and type “.setup”. You are now the Match Leader. Select the above options in the menu and press 1. Playing a Map Series to be Vetoed: During Playoffs when Map Vetoing is active for "Best of Three" and the Grand Final "Best of Five" matches, we will use the new Matchsetup 2.0 feature in our MatchMod, which sets up the server with Team Configs (anyone not listed as being on your team will be kicked). Vetoes will be controlled by team members that are predetermined and listed on their respective Team Profiles as Team Owner, Captain, Co-Captain or Scheduler in that order. Alltalk During Matches: Alltalk will be enabled until the match goes live. Also, immediately upon the end of the first half, alltalk is enabled for a few seconds before teams switch sides. Take a moment to tell your opponent “good half”. As soon as teams switch sides, alltalk is disabled. Alltalk will turn back on at the end of the match. Overtime: In the event that there is a tie, Overtime will immediately take place. Teams will remain on the side that the match ended on. Start money will be set to $10,000. Each team will play 3 rounds then the Match Mod will switch teams for you. Overtimes will continue until one team wins 4 of the 6 overtime rounds. Report the win exactly as the rounds show (example 19-17). Regular Season: (1) match per team on (1) map each week. Takes place over (9) weeks. Each team gets (1) BYE week. Please use that time to make good matches. Teams that no-show for the first 3 weeks will be removed from the league. Teams that fall behind more than two weeks in matches are risking disciplinary measures including being suspended from the league. Playoffs: Playoffs involve top (8) teams advancing. Playoff entry ties (8th and 9th place teams with same win/loss record) will be broken using rounds won. Playoffs and Semi-Final matches will be best of (3) maps with maps vetoed. Week #1 will be Quarter-Finals, Week #2 will be Semi-Finals, Week #3 will be Grand Finals. A large portion of the playoff matches will be cast on Twitch.TV/ClubConflict. We very much frown upon forfeiting during playoffs. Teams who forfeit before or during a playoff match may be suspended from league play in the future. If a team thinks they cannot play in the playoffs, it is best that they forfeit from the league before the playoffs, allowing another team to play. Grand Finals: The Grand Finals will consist of a "Best of Five" series and start no later than 6PM EST. Teams must coordinate with the CC Admins on the date so that we can promote and stream the Grand Finals. All (5) Grand Final maps will be vetoed by the teams. 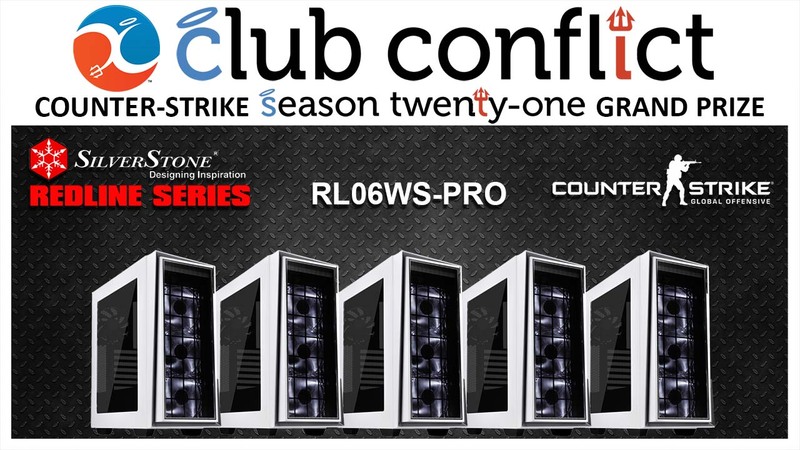 Championship Prize: Teams will be playing for (5) SilverStone Technology RL06WS-PRO Windowed ATX cases. Check back to this page as more rules will be added periodically. Good luck and have fun!